Essential Qualification: 10+2 or equivalent examination passed with science subject from a recognized Board and Radiographer/X-Ray Technologist course of minimum one year duration (including in field trining in diagnostic radiology) passed from a recognized institution. Essential Qualification: Degree in Science plus three years experience as Cardiopulmonary Pump Technician in a reputed recognized hospital. Essential Qualification: Graduate Degree in any subject from a reputed recognized University. How to Apply: All desired eligible Indian nationals are requested to attend Walk-in interview will be held on 18.8.2018, 10.00 hrs. in the office of Medical Director, B.R. Singh Hospital, Eastern Railway, Sealdah, Kolkata. 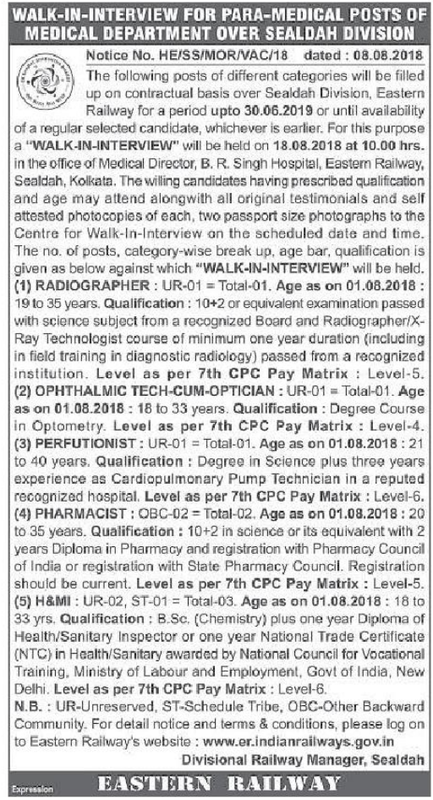 0 Response to "Eastern Railway Kolkata Jobs 2018-2019 For 07 Radiographer, Pharmacist & Other Posts"